After last month's terrorist attacks in the Indian city of Mumbai, which left more than 160 people dead, blame quickly began to zero in on Pakistan-based militants. Just as swiftly, Pakistan's Foreign Minister Shah Mahmood Qureshi responded with calls for "complete evidence" of any involvement by Pakistanis, declaring "our hands are clean." Just over a week later arrests were made in the case and Qureshi, a longtime member of the Pakistan People's Party (PPP), told the press, "They are Pakistani citizens and will be dealt with according to the law of the land." Pakistani officials would not allow the suspects to be extradited to India for prosecution and placed the alleged mastermind of the attacks under house arrest rather than holding him in prison. The ensuing weeks saw skirmishes between the two countries as the disputed territory of Kashmir came front and center in the battle to prevent militants from infiltrating the now hyper-vigilant India. Qureshi's response was sympathetic to an India eager to see justice brought to the attacks' perpetrators, but came with a no-nonsense warning: "We do not want to impose war, but we are fully prepared in case war is imposed on us." On Dec. 26, he again warned his neighbor country against "the mistake of surgical strikes," while calling back troops on leave and placing all military personnel on active duty.  Qureshi was born on June 22, 1956 to a wealthy landholding family in Murree, a hilltop region often used as a summer resort. According to the BBC, his family claims to be of saintly lineage. Qureshi's father was also governor of the Punjab region in the mid-1980s. With regards to his background, Qureshi has said: "Lineage is still important, but it is no longer paramount. Now everybody has to win the vote."  He received a bachelor's from Forman Christian College in Lahore. The Western-style private university was established in 1864 by American Charles William Forman. Qureshi also received a law degree from Cambridge University.  Married with one son and two daughters.  Served as an elected member of the Punjab parliamentary assembly for eight years before being elected to Pakistan's National Assembly in 1993. He served there for three years before being unseated in 1996, winning reelection in 2002. He remained in the Assembly until becoming Foreign Minister. 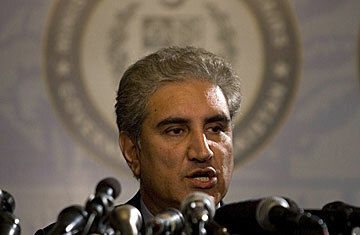  The late Benazir Bhutto, former Prime Minister of Pakistan, made Qureshi the Punjab PPP President in November 2006.  According to some reports, in 2006 Qureshi slapped an officer for beating a party activist. Qureshi's own home was raided after Pakistan's then-President, General Pervez Musharraf, imposed martial rule last fall, prompting a political crisis that eventually led to his own ouster.  An agriculturalist by trade, he is the president of the Farmers Association of Pakistan.  Despite having been unseated from the National Assembly in a 1996 election, Qureshi turned down a position in the Council of Economic Advisers to then-President Musharraf, a member of the Pakistan Muslim League party.